More Info about the RFID Coin PVC Tag? 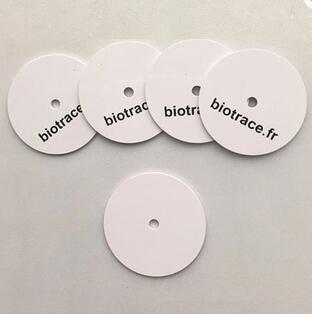 RFID PVC Coin Tag is a circular card that is laminated with a chip coil by PVC, similar to a work permit, a portrait card, or a bank card. It’s just different in shape, it can be coded, printed, with bright and matte parts. Size:15mm / 20mm / 25mm / 30mm,or Custom. Applicable to access control, public transportation, parking lot, identity authentication, attendance management, tickets, card payment, product identification, etc. Common chips such as EM4100, MIFARE 1 S50, MIFARE 1 S70, I-CODE2, Ultralight, F08. Previous Post Where to get the eco-friendly silicone laundry tag? Next Post What is the Feature for RFID Elastic Woven Wristband ?